A new type of organic solar cells (OSCs) with 11.6% efficiency has been developed by a research team, affiliated with UNIST. 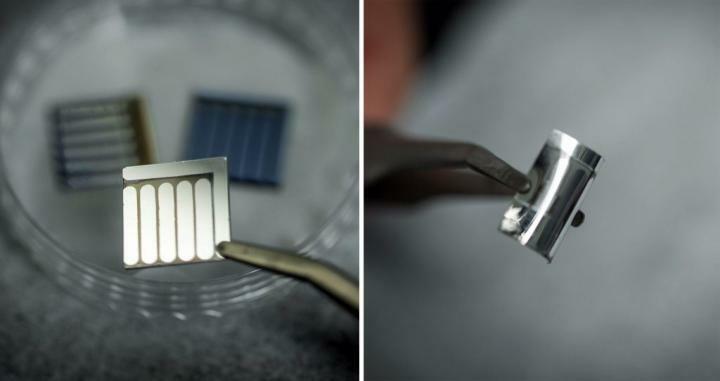 This solar cell maintained almost 80% of its initial efficiency after 60 days long-term test under elevated temperatures up to 120 degrees. In the study, the research team, led by Prof. HyeSung Park and Prof. Chang Duck Yang of Energy and Chemical Engineering has developed an effective and simple strategy to simutaneously improve and stablize the performance of OSCs by applying small amounts of the macromolecular additive to the photoactive layer in OSCs. This is a unique and unprecedented method, which applies the macromolecular additive to control the molecular weight. The team reports that "The use of the macromolecular additive introduced in this study has great potential for broad applications with other OSC systems, which will accelerate the commercial viability of photovoltaic technology." Organic solar cells (OSCs) are made of thin layers of organic materials with thickness in the 100 nanometer range. The light-absorbing material of OSCs, called the photoactive layers aborbs sunlight to generate electric charge carriers. The efficiency of OSCs are often affected by the materials added to the photoactive layers. In this work, the research team introduced the first demonstration of the use of a well-known n-type conjugated polymer, as the 'macromolecular additive' into the photoactive layer of OSCs, and report a remarkable enhancement in the device performance yielding unprecedented power conversion efficiency (PCE) of 11.6% with improved stability. Using the proposed method, they also demonstrated strong thermal stability in the additive-modified OSCs at elevated temperatures, as well as long-term operation stability. They reported that a stable PCE as high as 80% was still maintained after 60 days long-term operation under a high temperature environment (120?). In addition, by using the ITO-free architecture on flexible PET substrates, the team successfully demonstrated flexible solar cells processed with the macromolecular additive. Prof. Park states, "Due to its great applicability and easy accessibility, the use of the macromolecular additive introduced in this study has great potential for broad applications with other OSC systems, which will accelerate the commercial viability of photovoltaic technology." This study also includes the analysis of the optimization of power conversion efficiency in OSCs, the charge carrier transport properties in OSCs, as well as the changes in the morphology of the photoactive materials induced by the macromolecular additive. The research team attributes the improved performance to advantageous changes in the morphology of the photoactive materials induced by the macromolecular additive. Prof. Yang notes, "Our research is important in showing the influence of molecular weight (MW) on power conversion efficiency (PCE) of OSCs." This work was supported by Mid-career Researcher Program and Individual Basic Science & Engineering Research Program through the Korean Ministry of Science, ICT & Future Planning (MSIP). The results of the study have been published in the recent issue of Energy & Environmental Science, a world-leading academic journal of energy. Kwang Hyun Park, Yujin An, Seungon Jung, Hyesung Park and Changduk Yang, "The use of n-type macromolecular additive as a simple yet effective tool for improving and stabilizing the performance of organic solar cells," Energy & Environmtal Science, (2016).